No one was coming to help them. They were the only ones willing to go on this mission, a suicide mission. After 9/11, Captain Mitch Nelson leads 11 other men into Afghanistan. The team makes a shaky union with the Northern Alliance to help battle terrorist groups in the area. With each battle, the team and their alliance find themselves battling machine guns and tanks with horses and assault rifles. The events of 9/11 have inspired many pieces of literature. One of these is the book 12 Strong. 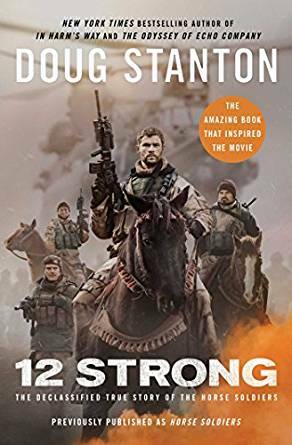 12 Strong – this novel, recently made into a movie shows readers what it was like for American soldiers in Afghanistan after the terrorist attacks and is told from a real life encounter. The novel takes readers on the journey where a US Special Forces team went to a dangerous war zone in Afghanistan with the hopes to capture a city. The members of the Taliban outnumbered them with a ratio of 40:1. The soldiers rode into battle on horses, earning them the name ‘horse soldiers’. The soldiers took the city of Mazar-i-Sharif after many hard fought battles and unexpected turns. This win paved the way for the US to get ahead in the war efforts. The book provides a sense of patriotism and honor because this battle was easily one of the most important wins that the US has had against the Taliban. The plot twists keep readers on their feet and make the book shocking but enjoyable. Anyone who is interested in 9/11 or the army should definitely take the time to read this novel.